“What is growing on my mulch” This is a common question I am asked here at the UConn Home and Garden Education Center. People are perplexed when they find a yellow foamy mass that looks like the neighbor’s dog vomited in their flower garden. Or when their nice white sided house is suddenly speckled with tiny black spots that will not come off no matter which cleaning agent they use or how hard they scrub. Or noticing the sudden eruption of very ‘interestingly shaped’ mushrooms popping up through the mulch. No, these are not the work of garden fairies and a miniature landscape construction crew, but the result of fungus and slime molds hard at work. All of the above named structures are the fruiting bodies of naturally occurring fungus. These are decomposers doing their job in life, rotting natural organic material, breaking it down into its basic chemical form. This is composting. The mulch most commonly used in our yards is dead wood and/or bark material chopped or shredded into a uniform size. We use it to keep the weeds from sprouting, to maintain a constant temperature of the soil and to retain moisture in soil. Mulch looks neat and showcases the plants. These are all great functions, but this mulch will not last forever. As soon as it is placed in the garden beds, the natural invaders attack it. Bacteria and fungi that live in all soil recognize this wonderful new food source for them! You have fed the decomposers and they are going to thank you by getting right to work. The bacteria decomposers are microscopic and not visible to the naked eye. Most fungus is also microscopic until it grows to the point of producing a fruiting structure, sometimes called a mushroom. This fruiting structure contains the spores or ‘seeds’ of the fungus, much like the fruiting structure of an apple tree is an apple which holds its seeds that can grow a tree. Weather conditions have to be to the fungus’ liking for it to reproduce. Fungus likes it moist. Temperature preferences vary with the type of fungus involved. 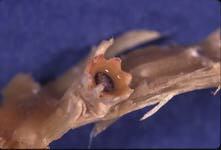 The body of a fungus starts as a single spore landing via wind currents or expelled from the fruiting structure. That spore grows into a strand called a hyphae; groups of these hyphae all grow together forming what’s called a mycelia mat. Sometimes this is visible as a white coating or mass. When the fungus matures and the weather is right, a fruiting structure appears above ground. This is the part we notice. Most all of the decomposers are harmless to our live plants. They feed on the dead material. All can appear spring through fall, especially after a period of rainy weather. No mushrooms growing in your mulch, in the lawn or in the wild should be eaten. It is best to consider all uncultivated mushrooms poisonous. There are experts in the field that can identify edible mushrooms. I am not one, nor do we have anyone at the University. Changing the environment will lessen all the fungal growth on any type of mulch. Keep the mulch dry. Do not aim sprinkles at mulch, but direct water to plant roots. When you do water, apply one to two inches of water per week, all at one time. Daily watering for short periods does not penetrate deeply in the soil, but remains in the mulch and top few inches of soil. Two inches of mulch is enough to retain soil moisture and block light from reaching weed seeds. Top dress last year’s mulch with a light ½ inch of new mulch to dress up the beds. In rainy times, stir up the mulch with a rake or how to break up any colonies of fungus. This will also fluff up and dry out the mulch making it less hospitable for fungal growth. As of this date, there are no fungicides available to treat mulches to control fungal growth. The most common encountered fungi we get calls about are chronicled here. 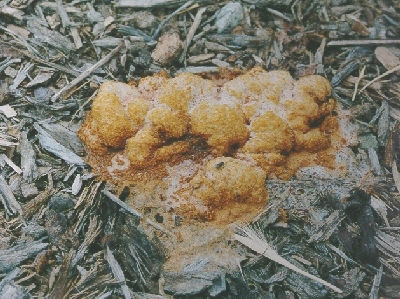 ‘Dog Vomit Fungus’ is a slime mold. Fuligo septica is its Latin name. Blob-like in shape and bright yellow in color that will fade to a sickly orange brown as it matures over the course of a few days. The final end results in a powdery brown pile that will erupt in a wisp of spore being released when it is disturbed. This cloud of fine dust is the way it mold spreads it spores to a new spot. It has no preference as to the type of mulch. 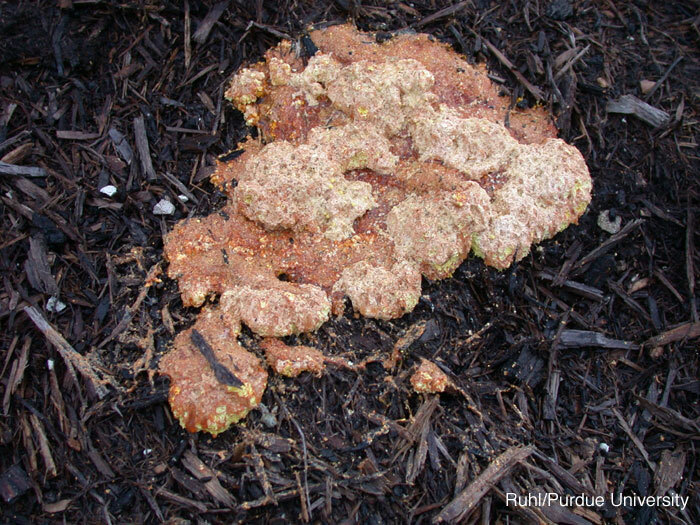 Slime molds feed on the bacteria that are feeding on the mulch, not actually eating the mulch directly. Control is not necessary unless you are unhappy where it is appearing. Just shovel it off to the compost pile if you don’t like it. I personally, enjoy watching the mess as it changes color, form and ages. Artillery Fungus, Sphaerobolus sp., is a much more of a nuisance and can cause damage to homes, cars and anything with reach of its spore spewing range. The artillery fungi’s fruiting structure is a tiny, 1/10 of an inch, cream or orange-brown cup with on black egg. When the fruiting structure is ripe, it explodes shooting its black, sticky spores twenty feet in all directions! The cups are attracted to light colored surfaces, due to their light reflecting ability. Of course, the sticky black spores show up nicely against the white background. The spores will not grow on vinyl or painted surfaces. They need dead organic material to feed upon and colonize. The sticky coating of the spores is incredibly strong and durable making it very difficult to remove. So far, no commercial or homemade cleaner has proven effective to remove the spots from cars or houses. If scraped off, they leave a mark or stain. Artillery fungus does prefer to grow on mulch made of the interior of the tree rather than mulch made from the bark. Soft woods such as pine, is also less hospitable to artillery fungus. 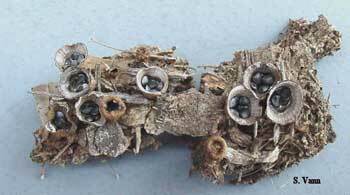 Bird’s Nest Fungus, Crucibulum and Cyanthus spp., look like tiny grey to brown nests holding tiny eggs. The nest portion can be up to ¼ inch wide. The egg looking part is a mass of spores in the nest released and splashed out of the holding cup when raindrops land on them. They do not shoot out like the artillery fungus. These spores sometimes stick to surfaces but are easily removed, not leaving a stain. Rarer than artillery fungus, this one doesn’t appear to have a favorite mulch as food. Stinkhorns are the fruiting body of the genus Linnaeus named Phallus after the shape of the mushroom. Taxonomists have separated and renamed the genus. 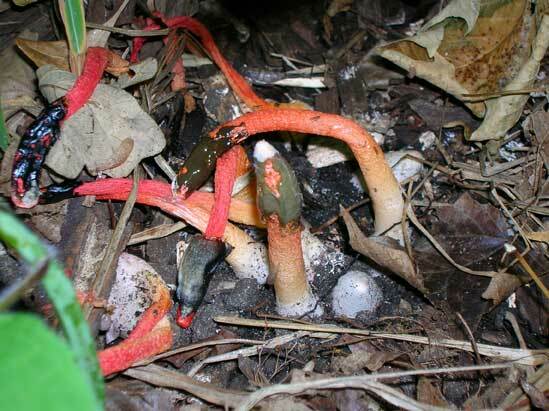 The common name of stinkhorn doesn’t quite describe how bad they smell. You will smell a colony of stinkhorns before you ever marvel at their sight. The strong scent is used to lure animals and insects that normally feed on decomposing flesh to touch them. The slime substance coating the fruiting body holds the fungal spores, attaching to the animal or insect which will move onto another area eventually spreading the spore far and wide. Stinkhorns can occur anywhere there is composted material as a food source. This was very informational thank however is it health hazard to humans growing near an open windows? If a person has mold allergies, these fungi might cause an allergic reaction. The molds themselves will not harm humans, and only feed on dead materials. Thanks for the information. This has been very helpful. I poured vinegar on my molds and they go away, but they kept on sprouting.Now that I know I will watch to see how they change if they appear again. Very interesting info. Thank you for the info….. Not a pretty sight in the garden, but glad to know it isn’t harmful to pets or humans. Found these bright orange fungus on mulch this morning and thought they were really neat. Couldn’t wait to look them up and find out what they were. I think they add character to my flower bed. Love nature. It never disappoints. Are any of these molds that grow on mulch of the aspergillus type? Thank you for this information. I just found a stinkhorn growing in the mulch and I had never encountered anything like it. I googled orange mulch mold and found this page. Great information! Great info. I noticed fungus growing on my mulch looking very much a that “dog vomit” but what really caught my attention was the abundant formation of a layer of very fine black dust near them. This dust could be readily blown away with just the hose. I assume this dust was spores. does the fungus , looking like dog vomit, hurt my tomato plants? should I do something? Shirley, It is not harmful to your plants. Just spray it down with water or remove it with a trowel. I have what looks like rabbit poop in my mulch. On top, under, front and back of the house. Is it a fungus? There are fungi that put out fruiting structures that can resemble rabbit poop, usually smaller though. Thank you for such an excellent, informative and mature article on these growths. This was very interesting and helped me identify what’s been growing in my flower bed (it was dog vomit fungus) haha. Great information, learned a lot about the mold growing on my mulch. Thanks! My mulch under a window air conditioner had what originally looked like dog vomit but later turned to a black dusty powder like substance. I tried to hose it down but a cloud of black dust billowed up. Now I’m afraid I breathed some of that dust in. Is it deadly? Dominic, it should not harm the Bradford Pear. How do I get rid of Stinkhorn in my mulch? Becky, The surest way is to remove any decaying wood matter and replace it with a non-organic matter but as that is probably all of your mulch you may not want to do that. There are no chemical controls but you could try removing it by hand. It may not reappear in the same spot next year. All of a sudden I have white shells on my mulch, they are long and thin approx 2-2.5 in long and have opened up as if something was inside the. There must be about 15-20 outside my window on top of my mulch which probably came from the damp dirt underneath.